Would you like to create a gift for someone special? Or enjoy a party that's a little out of the ordinary? At Genevieve's Gallery, you can choose an item from a wide range of mugs, bowls, plates, vases and egg cups etc. before personalising it with your own design in my workshop on site. You don't need any artistic experience and our friendly studio assistants are always on hand to help. 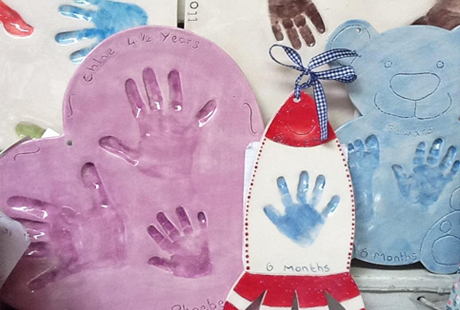 Preserve those precious memories with a hand or foot print in clay. We're very experienced in dealing with everyone from the very young to pensioners, to give you an exact replica you'll treasure for years to come. 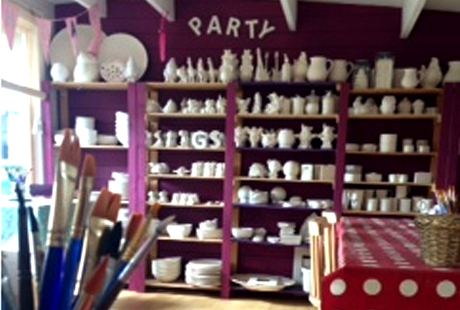 If you'd like to develop your talents further or express your creative side, we also offer adult pottery events to teach you a range of skills that enable you to create stunning pieces out of clay you can treasure forever. Contact us for further information about all of our services.